MADE EASY Cricket Academy is promoted by the MADE EASY group, which has emerged as the biggest institute for preparation of GATE and Engineering Services Entrance Examinations. Under the vision of Mr. B. Singh, MADE EASY group has witnessed steadfast growth and has extended its philosophy to Schools and Preschools. Mr. B. Singh is a serial IES qualifier who has embarked on the mission of transforming the scenario of education and learning in general. He has mentored thousands of engineers, shaping their careers in the form of technocrats, researchers, and distinguished government officials and established MADE EASY as a brand name synonymous with excellence. 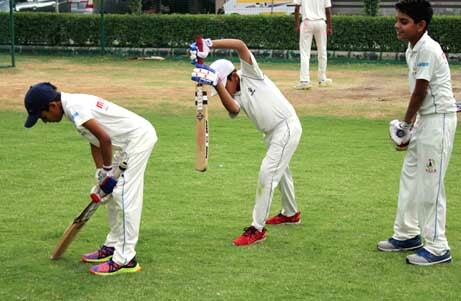 His vision for one of the best cricket academy - MECA - is to groom promising prospective sportsmen and churn out the finest cricket child future from Delhi. Mr. UTTAM MAZUMDAR, coach of MADE EASY CRICKET ACADEMY, was awarded CIAC INTERNATIONAL AWARD FOR BEST COACH. MECA Under-14 Team won Rebel Trophy 2018 against 3 Star Cricket Club by 5 wickets. MECA won the match against UMCC Noida by 5 wickets in under 13 SUMMER CRICKET TOURNAMENT 2018. Another win for MECA! Well done Team MECA!! MECA Academy won the match against Bhartiyam Academy by 4 wickets. Uttam Mazumdar is the founder & Chief Coach of UMCC - He was selected in Kolkata Knight Riders IPL Camp in the year 2009-10 at Eden Garden under Coach Dav Whatmore & also attended Delhi Daredevils IPL Camp at Feroz Shah Kotla in the year 2012. Uttam Mazumdar is the coach for Ishan Kishan who was selected in Ranji Trophy Jharkhand 2014-15. He is only 20 yrs old talented Opening batsman & Wicket keeper of Ranji team of Jharkhand & is also selected in INDIA U-19 team Probable.